The Canary Islands are a perennial favourite among European travellers looking to escape from the cold and soak up some sun. For us specifically, as travellers from sunny Singapore, it was a combination of the desire to: (i) visit Spain and practise my Spanish in the process; and (ii) dive in the Atlantic Ocean. Having a friend there was a welcome bonus! 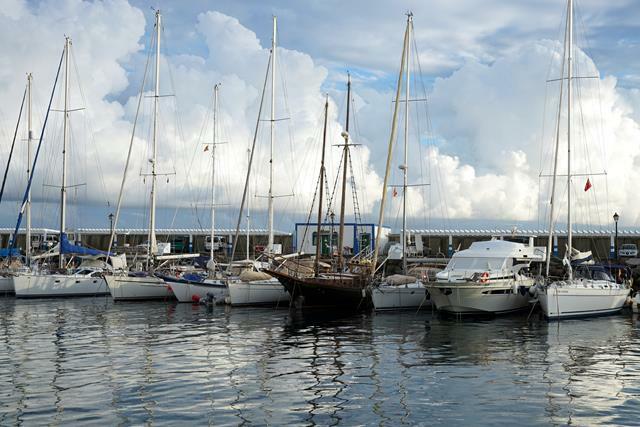 Since we were already going to Naples, I thought it would be convenient to fly to Gran Canaria from there. Just to be clear: it is not convenient. We ended up with an 8-hour stopover in London. Geographically, it makes zero sense but it was the fastest (budget) route. Gran Canaria is a massive island (by my standards) of 1,560 sq. km. That’s more than twice the size of Singapore (719 sq. km). However, its population is 1/6 that of Singapore’s. The terrain varies wildly – in the south are the tourist resorts, beaches and sand dunes; in the interior are mountains and pretty villages; and the north is full of lush greenery. I recommend renting a car to get around – traffic is not too bad (disclaimer: we didn’t visit Las Palmas, the capital) and buses don’t seem to be very frequent. Thanks to the rented car, we were able to visit many towns and villages along the coast and further inland. This post is focused on the coastal area; the others will be covered subsequently. For 5 short days, this was home for us. We rented a charming little AirBnB for less than EUR40 a night! 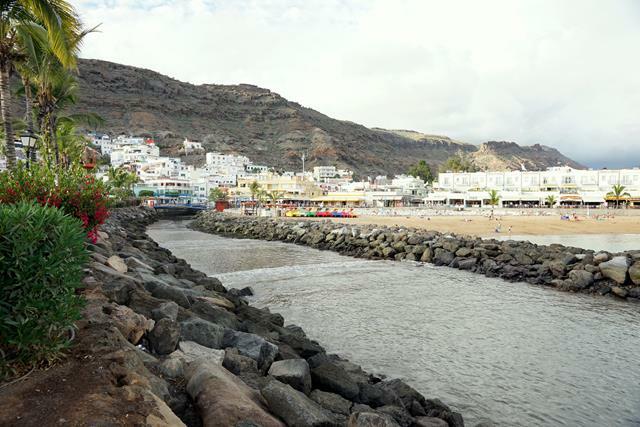 This section of coast in the southeast of Gran Canaria is popular with windsurfers and kitesurfers, and is much less touristy compared with the more popular resort areas like Maspalomas and Playa del Inglés. If you’re into windsurfing or kitesurfing, you’ll be very happy here. Places like Pozowinds offer courses, equipment rental and vacation packages. It’s really quiet after sunset and if you stay here like we did, you’ll have to drive out to get dinner. Lots of all-inclusive resorts, and hence a lot of tourists, here along the southern coast. We walked along the beach and invested in some ice cream (the weather totally called for it!). There were some cute sand sculptures but you apparently have to pay if you want to snap a picture. They do that in Boracay (the Philippines), too. Speaking of Boracay, it remains my #1 beach in terms of beauty. It has perhaps set too high a standard for all other beaches! 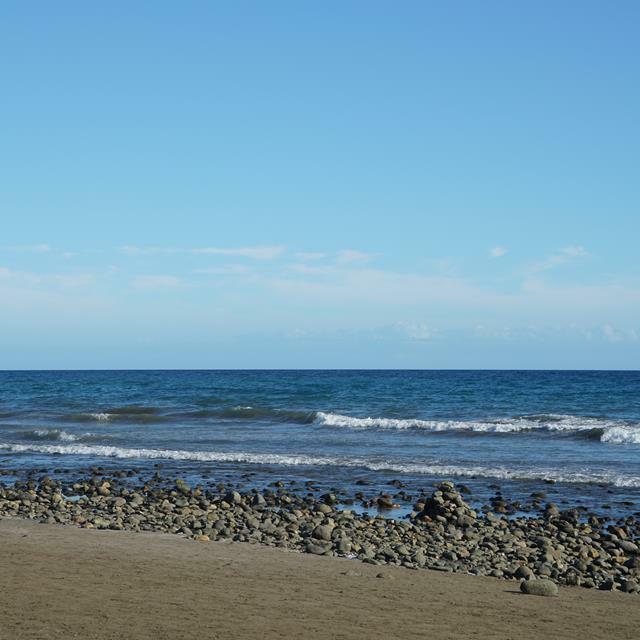 Here in Maspalomas, the beach was very pretty but I’m glad I flew here for more than just the beaches. 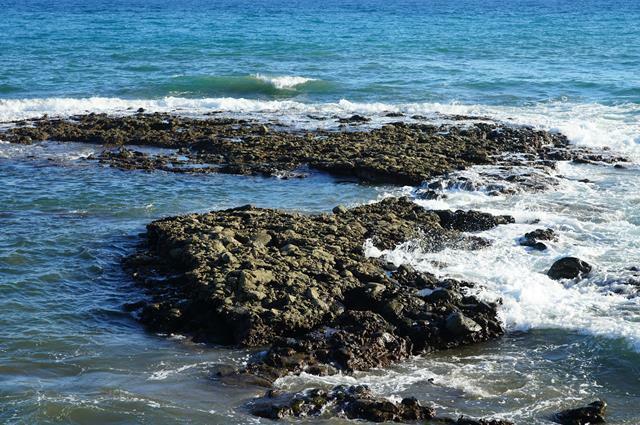 This looks like a random collection of rocks but it’s actually an archaeological site! It dates back to before the Spanish arrived on the island. 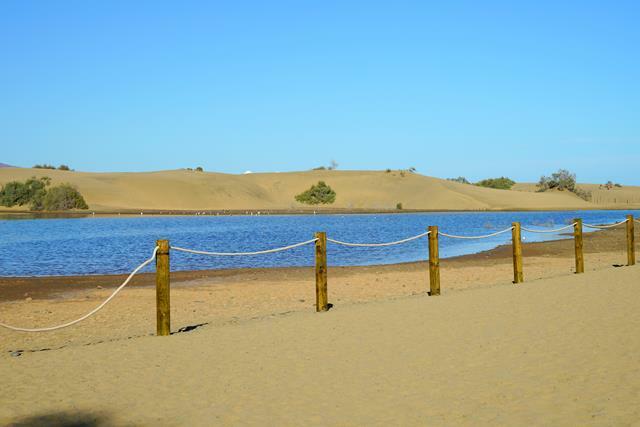 Did you know there are sand dunes in the Canary Islands? You can find them in Maspalomas. You can even do a half-hour camel ride into the dunes, although my guidebook warned that some of the camels are in “pitiable” condition. I wasn’t that interested, so we just took this picture and moved on. A small fishing village on the southeast coast – we went there at night for dinner and enjoyed a short stroll along the pier thereafter. I love being by the sea at night. It’s calmer, quieter and more relaxed. This is a pretty posh restaurant (by my standards) serving fusion-style tapas that was located along the beachfront. They have now moved to Maspalomas though. There was no English menu (a good opportunity to practise Spanish), but I’m sure the wait staff will be able to guide you through the options in English. 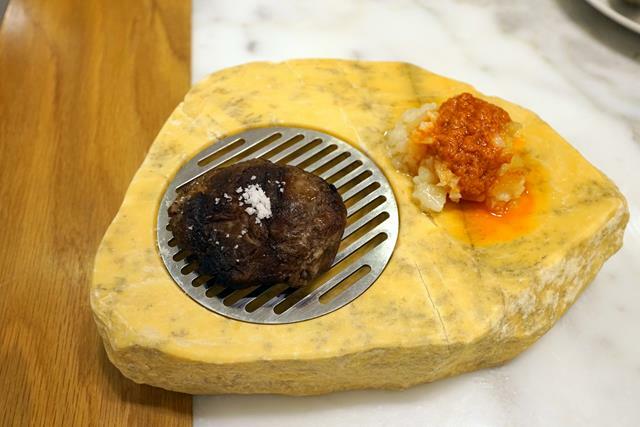 On the left: mini wagyu burger with cheese and rocket (arugula). 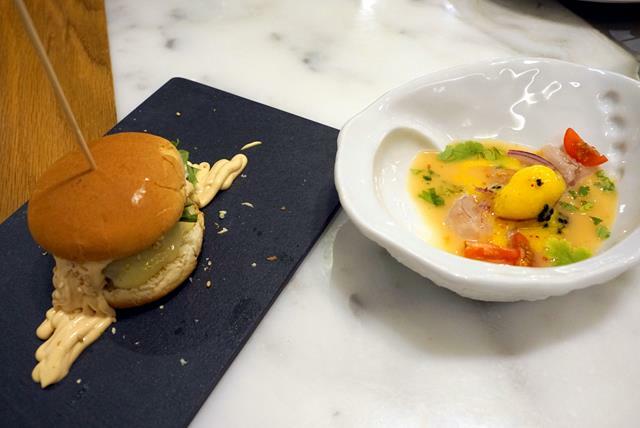 On the right: rockfish ceviche with chilli, red onions, cilantro (coriander) and spicy mango sorbet. Grilled pork cheek with potatoes and mojo. This was so good that we ordered two! 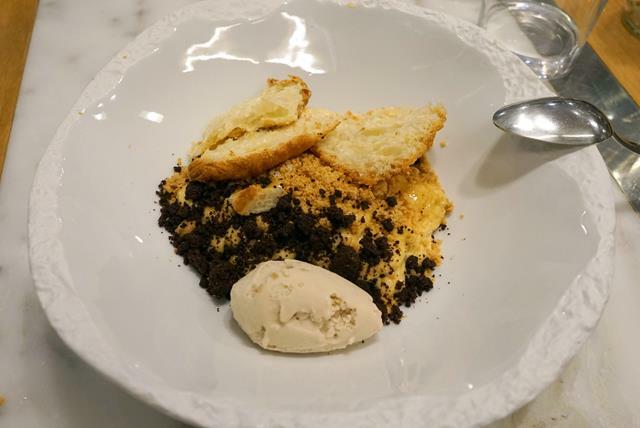 Dessert – croissant, ground cocoa, hazelnuts and ice cream. 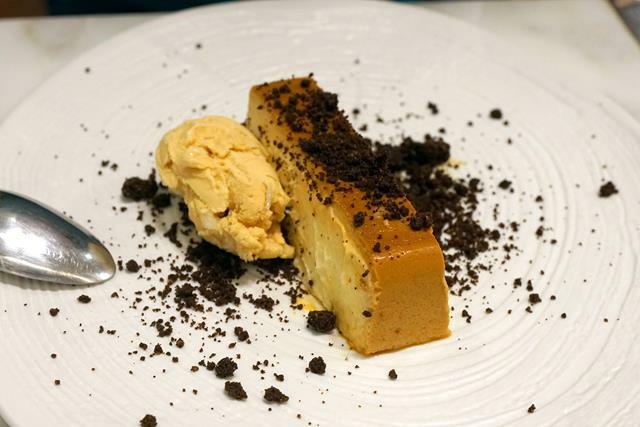 Another dessert – cheese cake with caramelised banana, ground coffee-cocoa and toffee-amaretto ice cream. In total, this cost about EUR30. The portion sizes, as you can probably tell, are “posh restaurant”-sized but we weren’t very hungry to begin with, so it was enough for us. 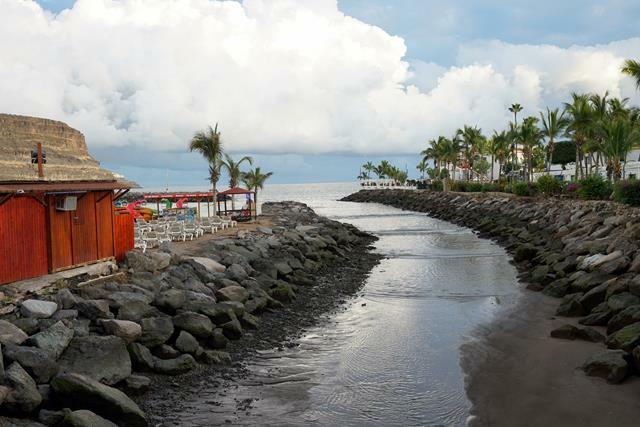 This seaside town is known as “little Venice” due to the canals. It was very pretty, albeit quite touristy with large resorts lining the beach. It seemed very popular with families. 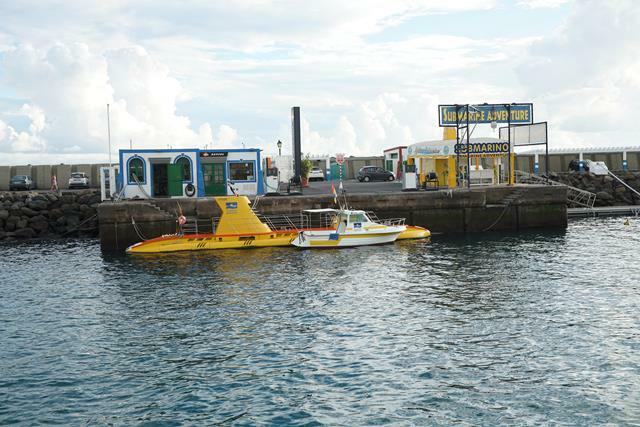 There was even a “submarine” docked at the yacht harbour! The houses were extremely well-manicured – perhaps holiday homes for the wealthy, or AirBnBs? The idyllic surroundings and abundance of restaurants make it easy to linger here. Well worth the half-hour drive from Pozo Izquierdo. We would’ve liked to visit this archaeological site, but it was closed. 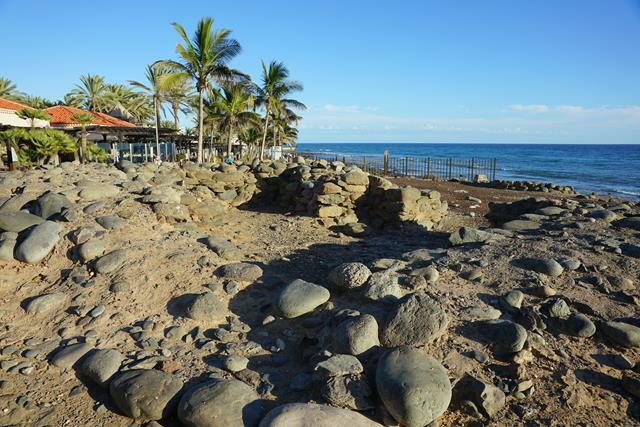 It’s the site of a coastal settlement for the island’s pre-hispanic indigenous people, estimated to be over 1,300 years old(!!). 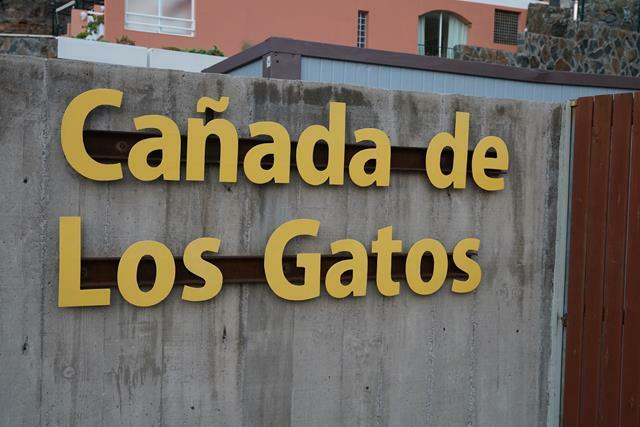 Fittingly, there were quite a few stray cats (gatos) hanging around the site when we peeked in. Opening hours: Tuesday – Sunday, 10am – 5pm (October – March) & 10am – 6pm (April – September). 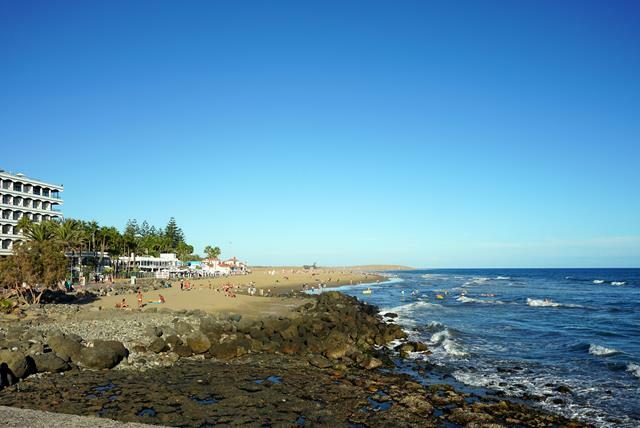 Located between Puerto de Mogán and Maspalomas, this town seems less touristy than both. On Tuesdays, there is a local market from 8am – 2pm with a huge selection of fresh produce as well as crafts and clothing, but we were only there for dinner. 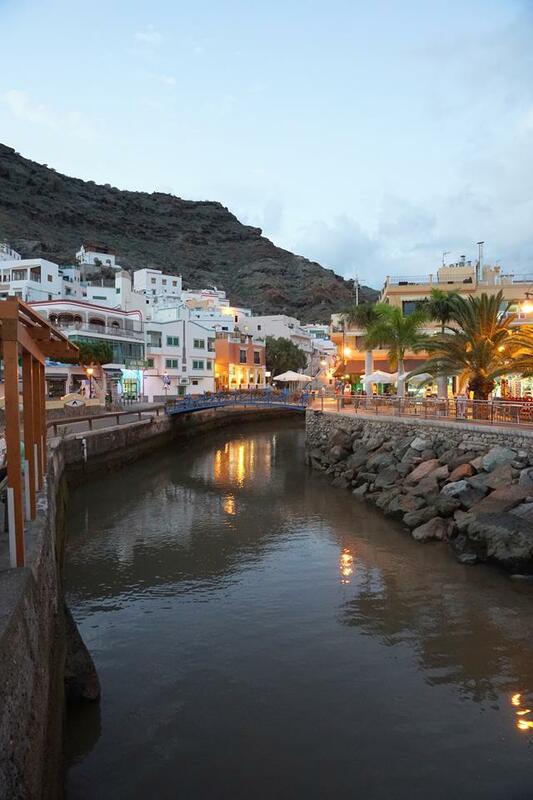 An al fresco beachfront restaurant serving typical Canarian seafood, tapas-style – it was suggested by our Canarian friends (whom we met there for dinner) and seems to be popular with locals and tourists alike. They told us that in the summer, you have to wait for up to an hour or more just to get seated! Thankfully, things are less crazy in October and we were able to get seats without waiting. 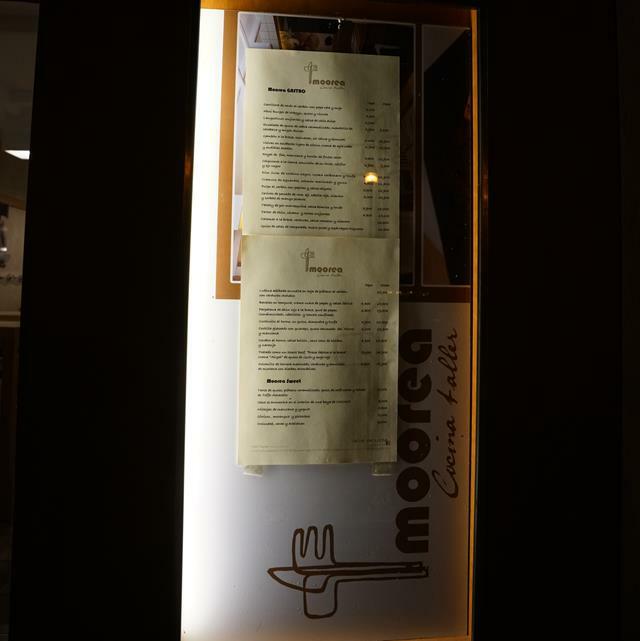 Sadly, I neglected to take photos here but I remember the mojo was good and we only paid EUR10 each for a decent amount of food! 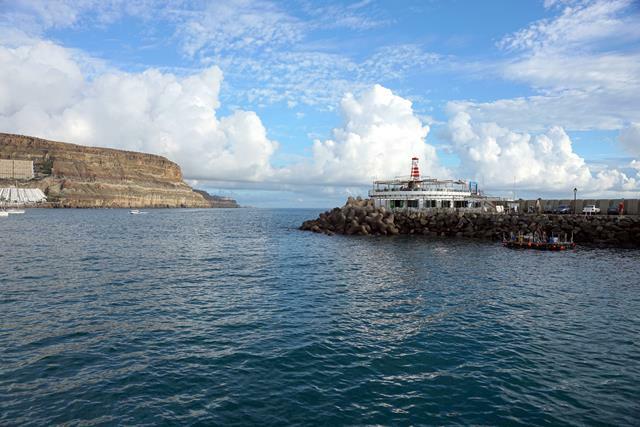 Have you ever been to the Canary Islands? What did you think of it? Interesting how we island people categorize islands in general by the size of our own islands. 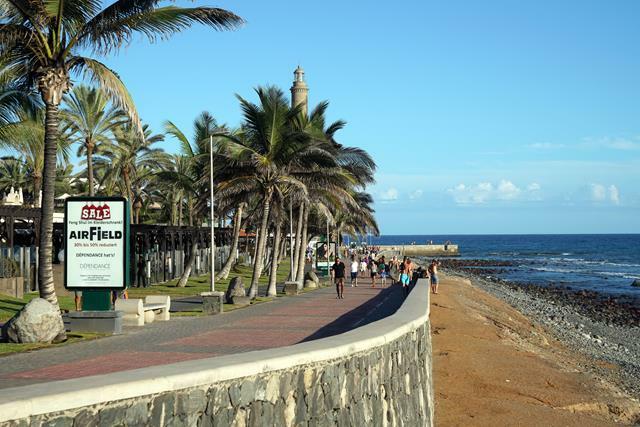 You consider Gran Canaria large when comparing it to Singapore. I consider it small when compared to Puerto Rico. Find that interesting! How very true, Ruth! I guess we all have different frames of reference. That’s what makes the world so interesting! 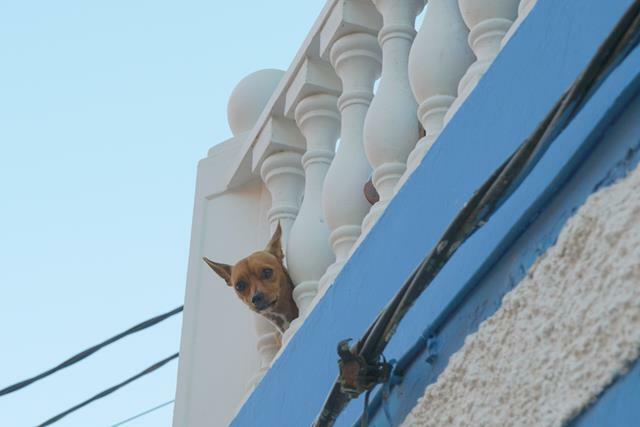 I envy you for visiting Gran Canaria. I’ve always wanted to visit the Canary Islands, but if I go I’d rather take a direct flight there. I don’t think it was tiring to spend 8 hours in London and doing this detour. These islands are the playground of the rich Europeans, so the beautiful home you’ve seen must have been their vacation homes. The prices seem to be reasonable however. 10 Euros for a good lunch doesn’t seem like much. Yeah, I think there’s a wide variety of food & accommodation options to suit all budgets! From what I’ve heard, Tenerife is more upmarket than Gran Canaria, which seems to draw a lot of families with young children, but i’m sure plenty of wealthy European have vacation homes there too! Looks lovely and I am pleasantly surprised to hear not everything is expensive! Indeed, Anisa – there are options for the budget traveler too! Thanks for stopping by! Sweet little spot to explore. I’m glad you found the posh eats! It’s nice to treat yourself to a posh meal once in a while, isn’t it? Thanks for stopping by, Elaine! I love a small town. We’re heading to the Canaries in the not too distant future, so I’ll have to remember this post. Love your photos. 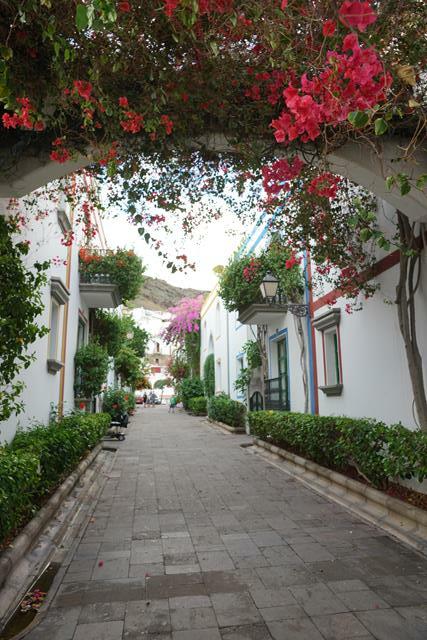 Enjoyed your post, particularly the photos of Puerto de Mogán. Thanks for sharing your story with #TheWeeklyPostcard and also for giving us a glimpse of what the island has to offer. 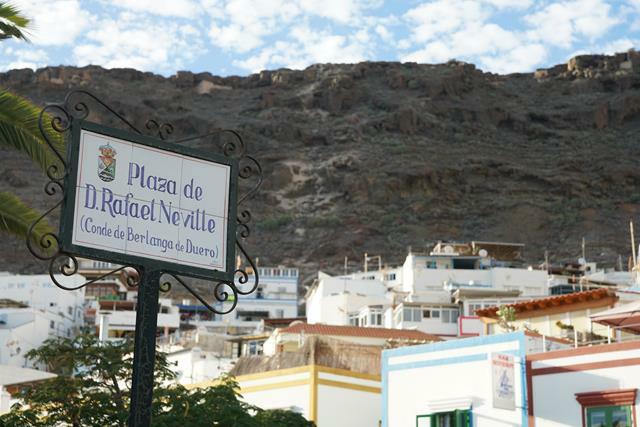 We have friends in Tenerife and have been wanting to visit for a while. Whilst I’m not familiar with Gran Canaria at all, I have been to Singapore a few times so your comparison really helped me to get a sense of its size. 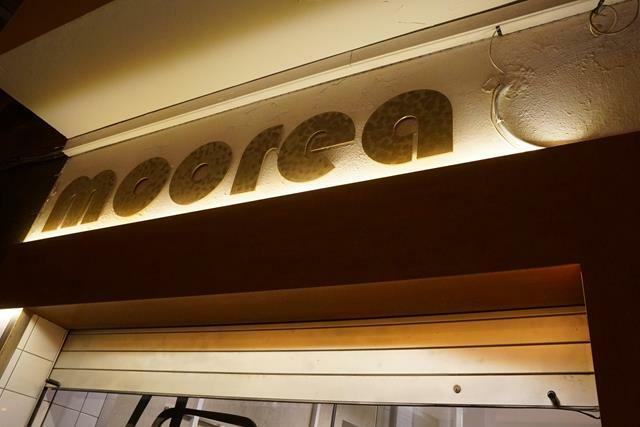 It sounds like we will be spoilt for choices when it comes to dining options. I might just go straight for the desserts. Yum! Definitely plenty of dining options! 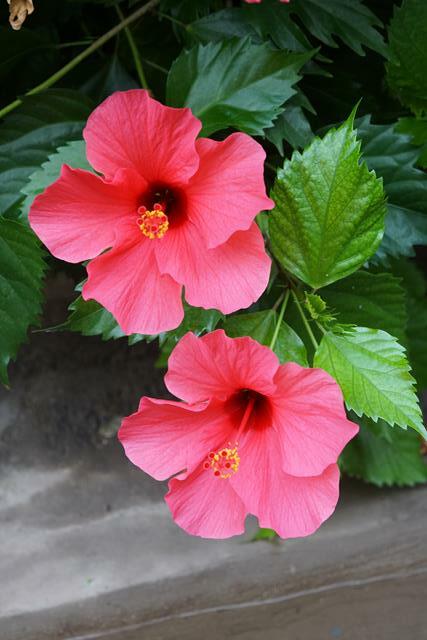 I didn’t make it to Tenerife so will be looking forward to your posts on it if you do visit 😄 thanks so much for stopping by and commenting, Linda! It really was! I just wish it came in bigger portions, haha. Thanks for stopping by, Jessica!